There’s something about kits—containers with small compartments and tools—that children love. All you need is a coffee can, paper and other supplies from around the house to create a Park Explorer Playkit, with materials for exploring, taking notes and cleanup all in one safe place. After making your kit, your child will have a blast exploring the backyard or park—finding unexpected treasures along the way! Create the playkit. Clean and dry the coffee can. Cut a piece of ribbon or yarn long enough that a child can wear it across his chest or on his shoulder, about 24". Poke two small holes, about 2 inches apart, through the plastic lid of the can. Thread the ribbon through and tie the ends together on the underside of the lid. Grab some stickers and have your little explorer personalize the can with markers or stickers. Explorer Notebook: Two playing cards are the front and back cover for each tiny Explorer Notebook. We recycled old tablets by cutting the unused sheets to the size of the playing cards, stacking about 10 sheets between the cards, and stapling everything together at the top of the cards. The playing cards make the notebook just a little sturdier, and the size is perfect for a Park Explorer Playkit. Pencil or Pens: Any writing implement works, so whatever is close by and fits into the playkit is fair game. Explorers will only need these for note-taking, so no need to include a whole pack. Pokers: Add two or three large and small Popsicle sticks to the playkit. These "pokers" will help explorers examine and navigate around dirt, grass, plants, or mulch while investigating. 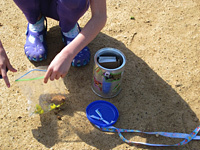 Specimen Containers: Place one or two small boxes, mint tins, or film containers inside the playkit. These pieces will be the Specimen Containers, keeping unusual plants, insects, or objects safe until explorers return to the "lab." Your child can personalize the containers, adding stickers or labels if they'd like. 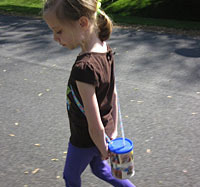 Waste Caddy: The small bags (or an extra small container) can be used as a Waste Caddy. Most explorers will run into some trash along their route, so it' wise to have something to put it in until they reach a trash can. Sometimes, all kids need is a simple reason to go out, even into their own backyard or local park to explore. These Park Explorer Playkits are easy to assemble and give kids extra incentive to take a closer look at the world around them. Encourage explorers to lift rocks, look under bushes or just sit still, observing their everyday play area or park from a different point of view. Amy shares the many ways she makes learning fun at teach mama. Head over and find more ways to build a solid foundation of learning for the little guys in your life.